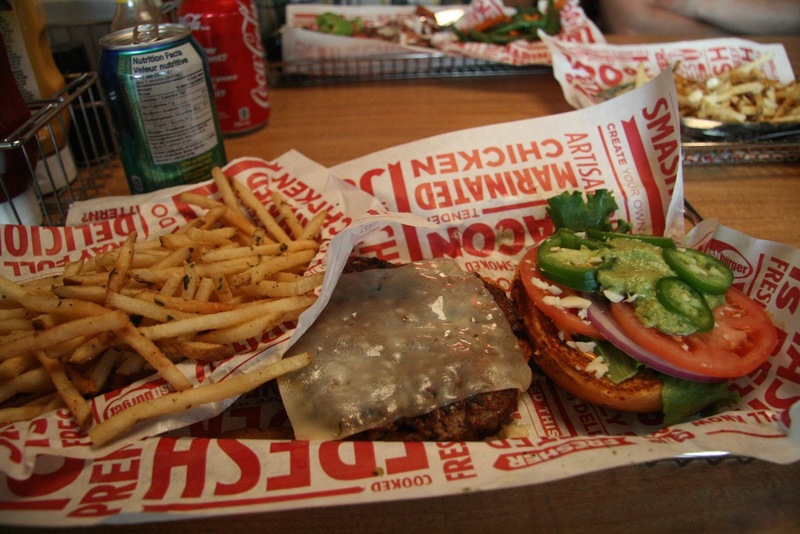 On July 2, we were invited to preview Smashburger in Sherwood Park before it opened for the public on July 3. Smashburger is originally from Denver, and this Smashburger location in Sherwood Park is Smashburger's third opening in Alberta; with its first two in Calgary. While Dan & I were waiting for our friends to arrive, we ended up meeting Scott Crane (President) and Greg Creighton (COO) which was pretty neat to say the least. They mentioned that they had recently opened a Smashburger in Kuwait, and were currently in town for the opening in Sherwood Park. 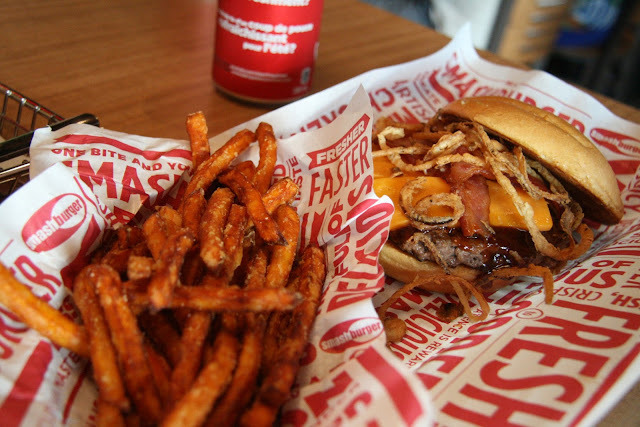 So, you are probably wondering, what makes Smashburger different then others? First off, Smashburger wants to give you a "better burger" experience. All of their burgers are made fresh from 100 per cent never frozen Certified Angus Beef smashed on a 400 degree flat grill. 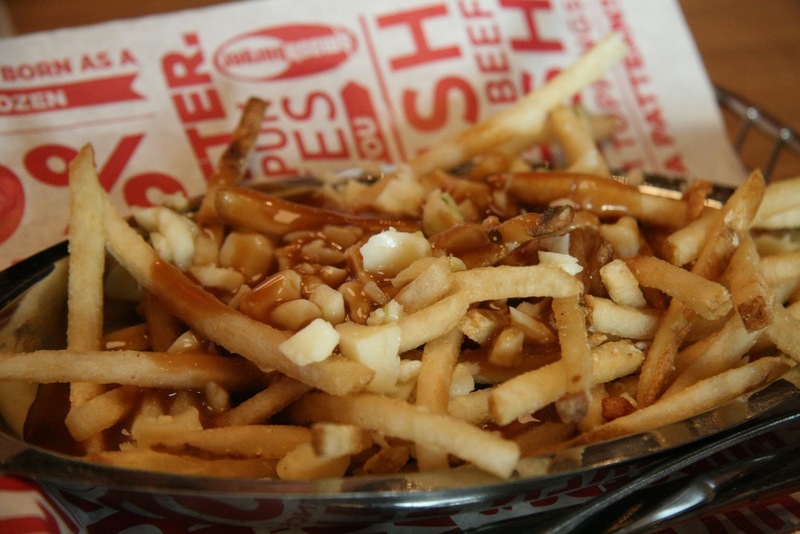 For the restaurants in Alberta, they hope to have a menu that is regional - such as having an Edmonton Smashburger, Edmonton Smashchicken and Saskatoon Berry shakes. There is the option of creating your own burger, but most of the signature choices or classics had what we wanted. We ended up ordering 4 burgers and almost all options of sides possible. They weren't ready with the fried pickles yet; so maybe sometime in the future you will see them at this location. In order to truly test the flavours of each burger, we split each burger up. Of the burgers we ordered, I enjoyed the Classic Smash and the Avocado Club. The meat in both retained its juice and went well with the rest of the condiments - ketchup, lettuce, tomatoes etc.. on the Classic Smash and avocado, bacon, tomato and ranch dressing on the Avocado Club. While the meat is certainly prepared the same way on each burger, the meat on the BBQ, Bacon & Cheddar seemed to be a tad dry and comparatively more salty in comparison to the other two burgers. I'm thinking that the dryness and saltiness likely came from the combination of the cheddar, bacon, and haystack onions. 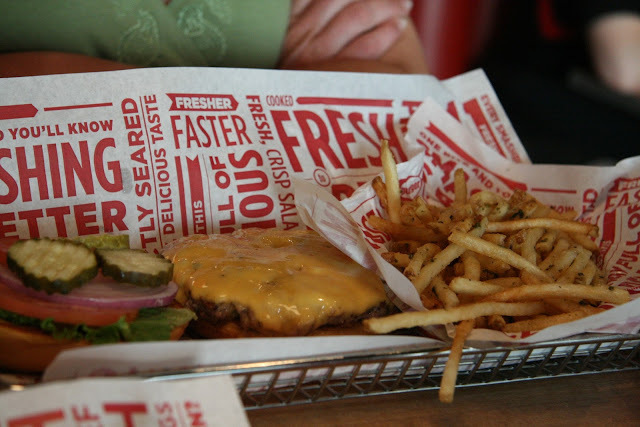 There were also samples of Smashburger's delectable shakes going around so those went quite nicely with the burgers. haystack onions on an egg bun ($6.99) with sweet potato fries ($2.99). Last but not least was Dan's Spicy Baja burger. Definitely packed a punch for me. However, Dan felt that it was the perfect burger for him: juicy, good balance of guacomole to spice content and flavourful. tomato, onion, chipotle mayo on a spicy chipotle bun ($6.99) with smashfries ($2.49). 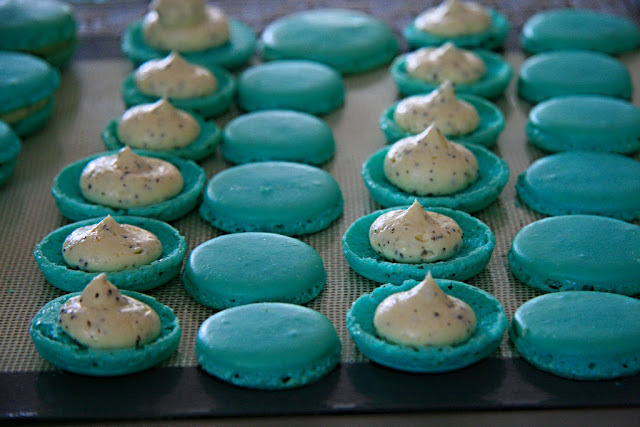 Now for the sides. The winner of the night at our table was most definitely the sweet potato fries (pictured above with the BBQ, Bacon & Cheddar sandwich). 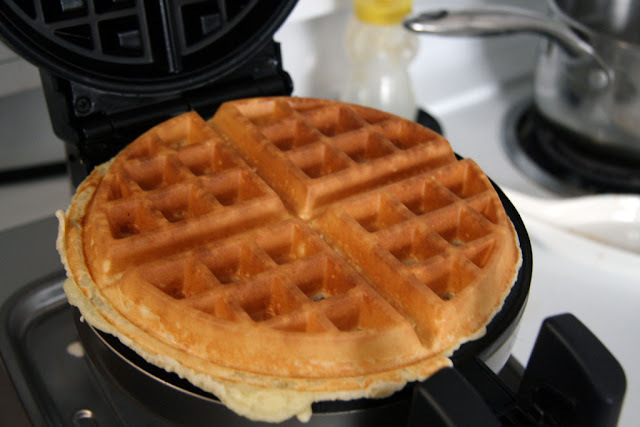 Perfect crunch, not too much oil or salt. It also stayed crispy while we dined. The next favourite was the classic smashfries. Like most people have mentioned, the addition of rosemary, olive oil and garlic are a perfect combination. We also had the poutine. Like all classic poutines there was a good balance of cheese curds to gravy. Unfortunately, the gravy and the salt on the fries, made this particular side rather salty. Last but not least, were the delicious shakes. We didn't get a chance to try their full sized shakes, but of the flavours we tried - strawberry, vanilla and saskatoon berry we all enjoyed the strawberry and saskatoon berry shake. When asked what kind of ice cream they are made with, the owner said that he decided to use Nestle (the sister company of Haagen-Dazs). The Saskatoon Berry Milkshake was really tasty and was made with real saskatoon berries which made it a bit difficult to drink with the regular-sized straw we were provided (we got around this by simply drinking the shake from the cup). 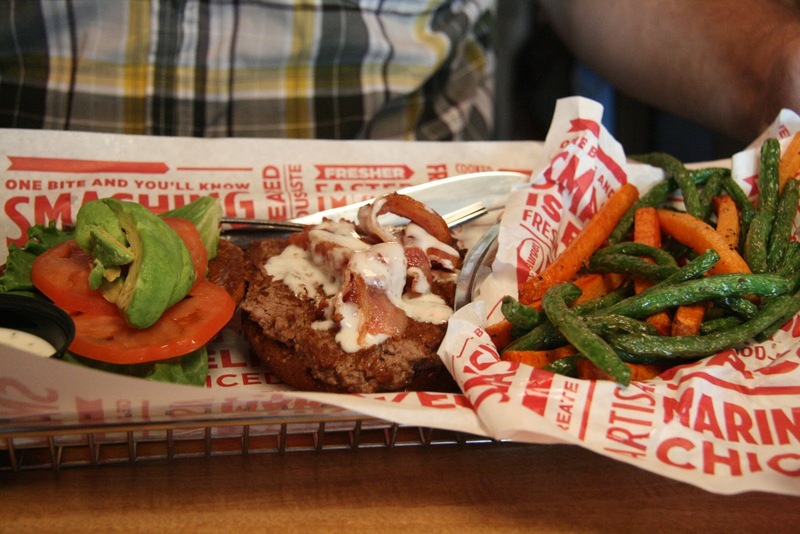 Overall, everyone had a good meal at Smashburger in Sherwood Park. I would definitely go back if I was in the area. 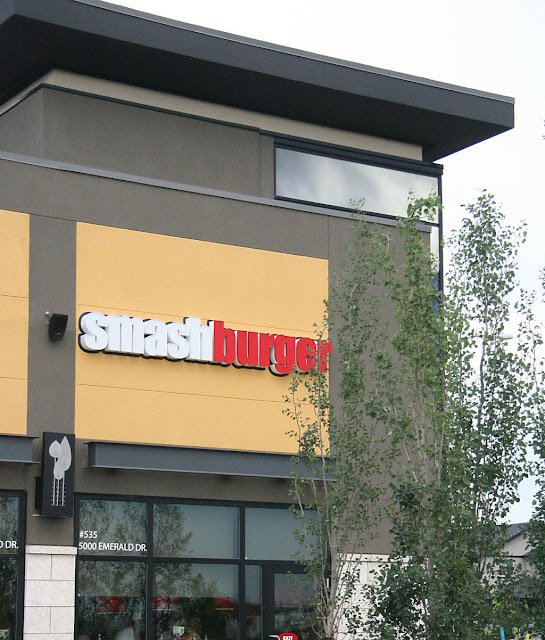 Hopefully there will be plans for a Smashburger in Edmonton in the future as that would make it way more accessible the next time I'm craving a fresh burger. If you're wanting a chance to try out Smashburger you can find it at #535 5000 Emerald Drive, Sherwood Park AB. Truthfully, finding it at first can be tricky. Since I'm a visual person, this Smashburger location is in a small food complex across from the Winners and Bulk Barn.